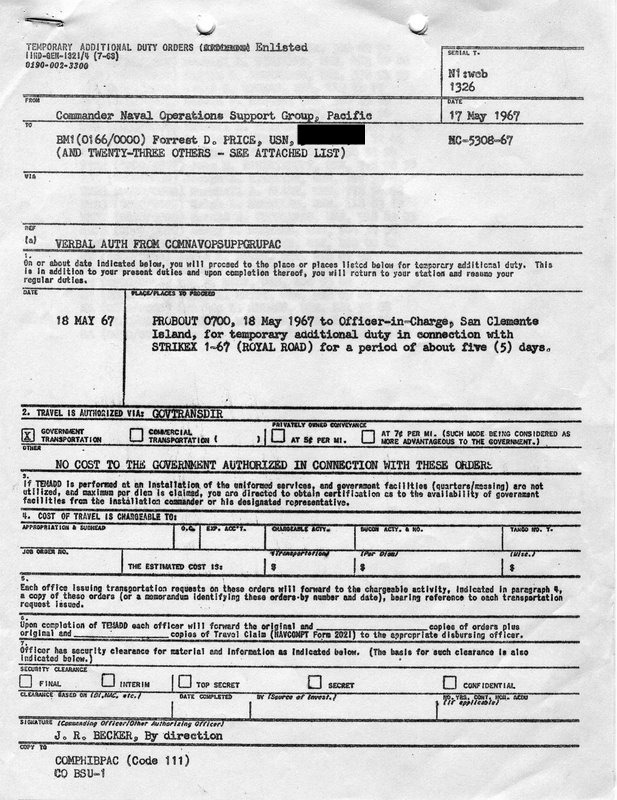 (added 12-10-06) I got out of boot camp the end of October 1965 and reported to my duty station, which was Boat Support Unit One in San Diego. 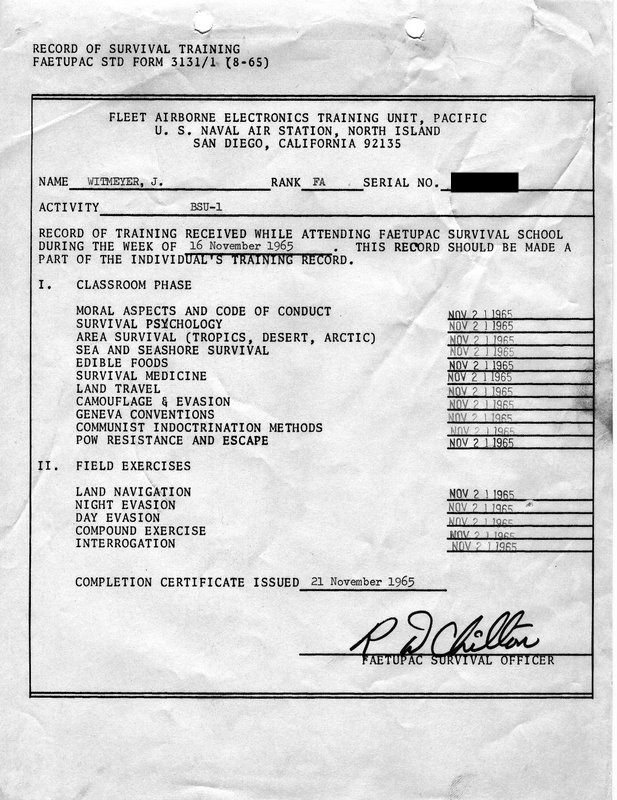 After I was there a couple of days, they informed me that I would be going to S.E.R.E (survival, evasion, resistance, and escape) training soon. Well, the middle of November I started the training. It was a requirement that everybody in our unit goes to this training. Boy, was this an experience. I thought to myself, what is a naïve, shy, seventeen year old doing here? It was the week from HELL. I think everybody will agree on that word as a description. The week was spent in the mountains near Warner Springs, north of San Diego. Some of the others I heard went to Whidbey Island in Washington for the same training. I don’t need to go into all the details of this training, we all have our memories. However, the funny part of this was at the end of the training. We all where starved and lost a lot of weight (I couldn’t afford to lose it). On the bus back to our base in San Diego, the driver stopped at a small shopping center for us to buy some food, since we were all really hungry. My eyes were way bigger than my stomach. I remember buying several donuts at the donut store and a couple hamburgers, fries and coke. I don’t think I ate but about 1/8th of all that junk food. Everybody else was just like me. Our stomachs shrunk to the size of golf ball. My job in the unit started as a low life engineman (FA) working in the shop on the pier. One of the first days in the shop I was told by Chief Fox to go make some coffee. Since I didn’t drink coffee, I didn’t no how to do it. I was very nervous when I asked him how to do it. In his rough voice he told me to fill up the large coffee maker pot with water and add coffee grinds to the inside holder/strainer. Well I took the pot outside to get water and I looked inside and saw how dirty it was with coffee stains. So I thought I would be nice and clean the metal pot with that old cleaning powder we used for everything. Then I put fresh water and grinds in the freshly clean coffee pot. I sat down in the shop and listen to all the talk from the old timers. When the light on the pot came on to signal it was ready, Chief Fox jumped up and got the first come of coffee. He took his first sip and went into a rage about the taste of the coffee. He wanted to know what I did to make such a bad pot of coffee. After I told him what I did, I got yelled at from everybody and felt like an idiot. I learned that you don’t clean a coffee pot with all the built up coffee stains inside, that is what makes the coffee taste better, at least for these navy men. Well, a good thing did come out of this, they never asked me to make another pot of coffee again……..
A lot of us would go to San Clemente Island for simulated PT boat attacks on the Pacific Fleet. We used boats like the LCSR’s, Swift boats, and PTF-13 for these exercises. Some of the more senior people on the boat crew brought rifles (AR-15, or commonly called M-16) or other weapons. As we approached alongside San Clemente Island, we usually saw mountain goats climbing up the cliffs. The people with the weapons always took a few shots at the goats, but they always missed. When we docked on the island we had the day to ourselves. Most of the nights were for our maneuvers with the ships. We would attack using a flare gun as a simulated torpedo. 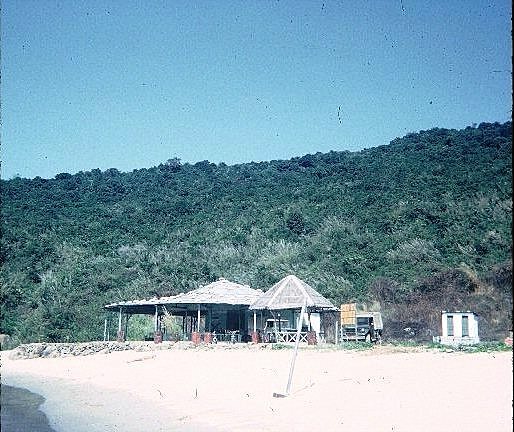 I enjoyed the island exercises because the food was really great at the mess hall and I was able to drink beer at the club on the island. They never asked me for my ID. However, one exercise was really memorable. For some strange reason, we were told one night to go out to sea with heavy fog and make one of our simulated attacks. We saw the ship on the radar and made our attack on the ship. We couldn’t see it because of the fog but knew it was in front of us, so I shot the flare gun. Just then we saw the ship right in front of us. We missed the ship going full speed but caught the wake behind it. Our boat hit the wake head on and came out of the water. We lost water suction so the engines shutdown. I don’t recall who was on the swift boat with me that night, but it was sure scary. We called it a night and went back to the island. Thank god we were in a swift boat and not a LCSR. 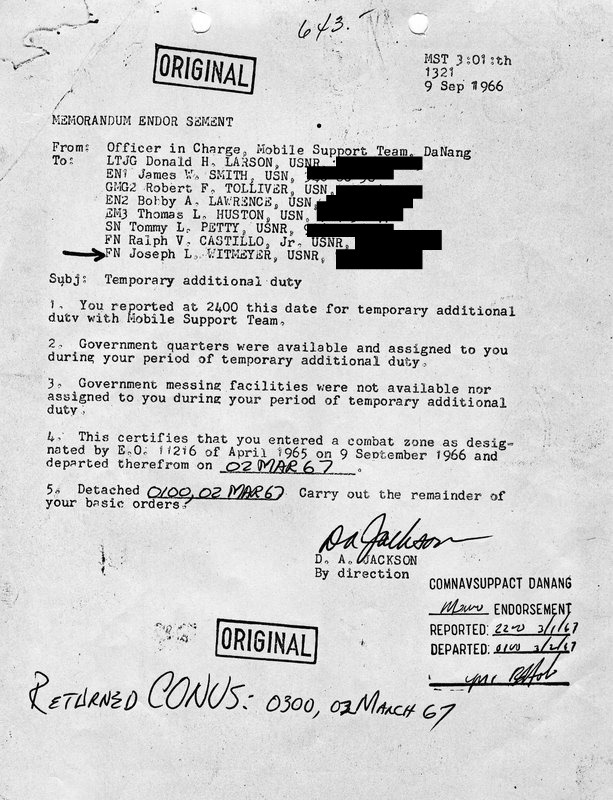 The swift boat was enclosed whereas the LCSR is open. We would have all fell overboard if we were on a LCSR. 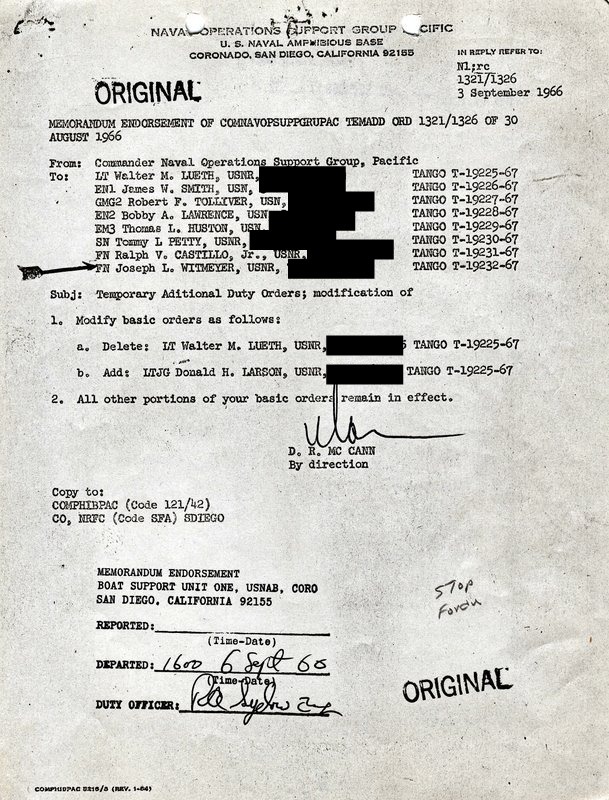 Since our mission at Danang was classified secret, we didn’t talk about it. 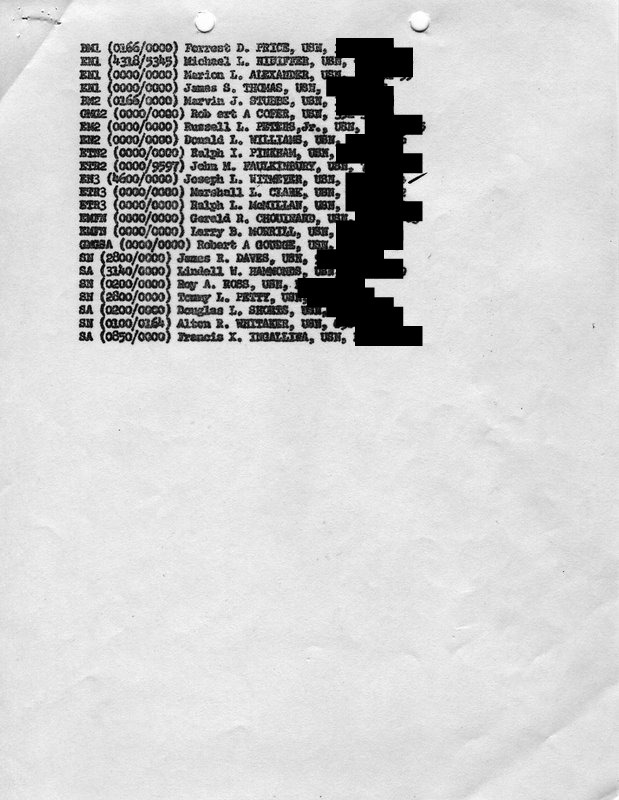 Now forty years later I think it is public knowledge what we did. 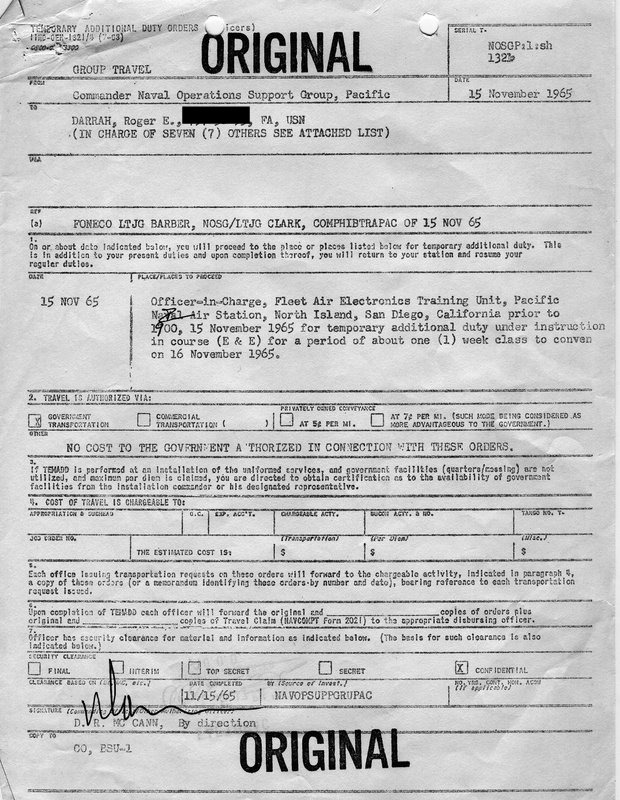 My trip to MST-1 for temporary duty was from early September 1966 to early March 1967. 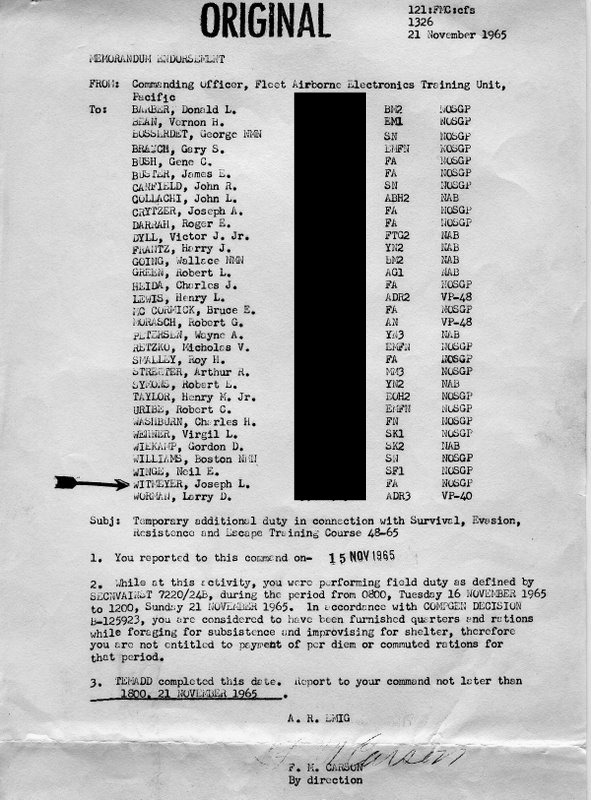 Our group from BSU-1 flew in a cargo plane, I think C-46, to Vietnam. It took us several days with a lot of stops to get to Danang. Landing at the air base in Danang in the middle of the night was exciting. To avoid being shot at, the plane made a steep and short approach to the runway. It felt like a rollercoaster drop. We could see flares going off all around the airbase, so I was wondering if the airbase was under attack. When we landed I discovered the flares were normal. 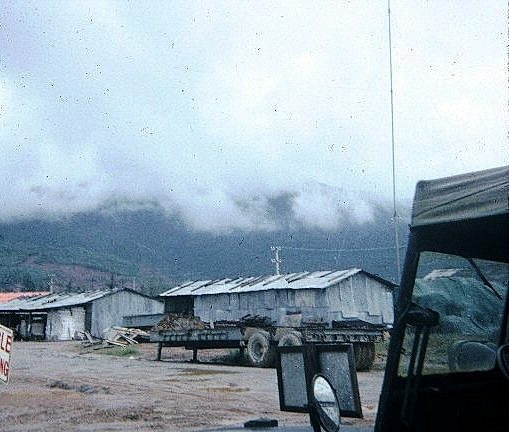 We had a truck waiting for us as we landed and then we drove to Camp Fay base where we lived. Driving in the late night hours to our base was quite scary. All kinds of things ran through my mind. I thought for sure the VC was going to attack our truck. Nothing happened. We arrived save at our base. As it turned out, things were quite save for us during my time there. But I didn’t realize how safe until I left. The trip home was on a Boeing 707 MACV flight to Norton AFB. What a difference in flights. 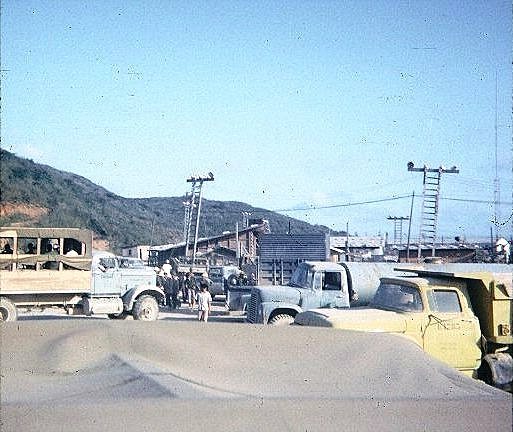 I was assigned to the boat shop at the spook base where the boats were docked. My job was to take care of the swift boats, engine on the crane barge, mike boats, and generators for the base power. 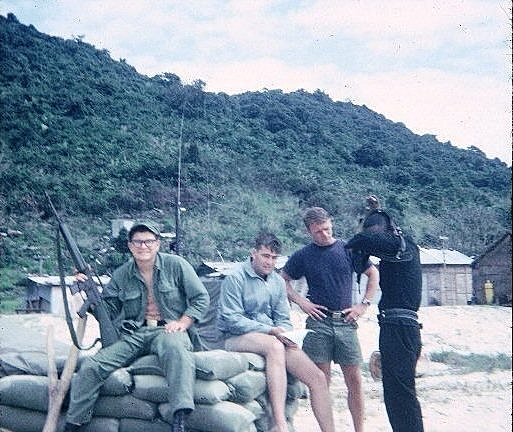 We all have numerous stories about things that happened in Danang and of all the hard work. I think we had duty watch every three days. So two days out of three were open for us after work to enjoy ourselves. One free day I went to our little private beach for a little fun. Everybody took turns water skiing. Since I was the youngest there and didn’t know how to water ski, I waited for everybody to have their turn. Later in the day, it was my turn to learn how to ski. After several attempts, I finally got up on the skis. Boy, was I hot stuff…. I don’t recall who was in the boat pulling me, but they decided to take me out into the middle of Danang harbor. Cruising in the harbor was really great, until the motor in the boat crapped out. I think it ran out of gas from all the use that day. As I sank in the water I heard somebody from the boat yell “don’t lose the skis”. Hanging onto the skis, bouncing in the middle of the harbor, I tried to swim back to the beach. I was making very little progress. Meanwhile, a couple freighters passed me by. That wasn’t fun dodging those ships and getting tired treading water. Finally, a junk full of Vietnamese fisherman came to my rescue and took me back to shore. The ski boat got back to the beach somehow also. Everybody on the beach had a good laugh about me being stranded in the middle of Danang harbor. I didn’t think it was funny at the time. That was the first and last time I went water skiing. I didn’t want to risk another episode like that. Tom Huston took a picture of me that day before I went skiing. See Tom’s pictures, I had the green trunks on. I don’t know how many of us Americans at MST-1 actually went on a mission with the Seal Team, but I believe there were a few others besides mine. One night I was told that they needed an all American boat crew ( I don’t recall any of the names) to go out on a mission with a Seal Team on one of the Nasty boats. Apparently, they couldn’t find a second Nasty boat engineman to go on that mission, so they picked me. 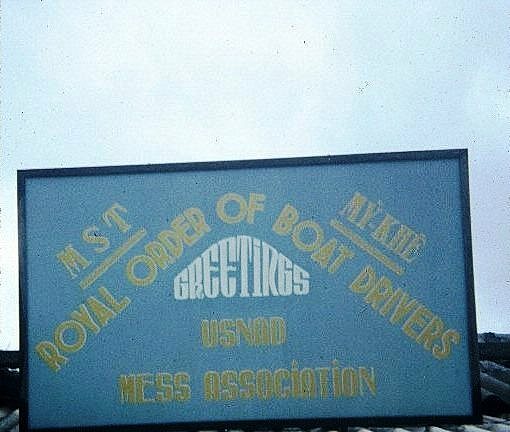 I guess most of the enginemen that worked on the Nasty boats where on duty or working late trying to fix the engines on other boats, or didn’t want to go. I had almost no knowledge of the Nasty boat engines, but I was an engineman, so I could at least help the other engineman on the boat crew. I felt really honored to be going out on a special mission with the seal team. Of course, I was also young and stupid. When night came, our boat left DaNang harbor and turned left to go to North Vietnam. That sure got my attention! I had no idea where we were going, but it took a few hours to get there. 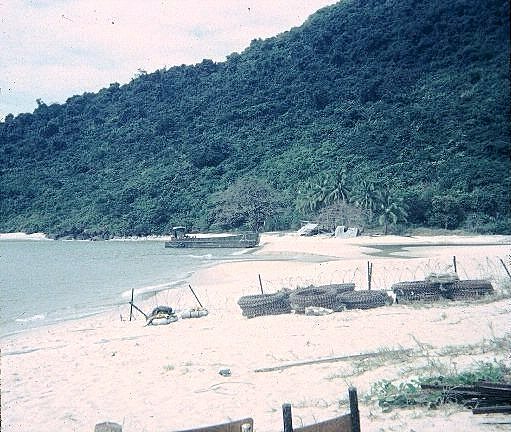 We reached a place off shore of North Vietnam and the Seal Team boarded two rubber boats (Zodiacs I guess) and went toward the beach. We left the boat engines running the whole time for a quick getaway. After awhile, one of the boat engines died on us. Panic struck us all. The other engineman, who new the engines a lot better than me, worked feverously for a long period of time to get it started, but determined that it wasn’t possible for him. 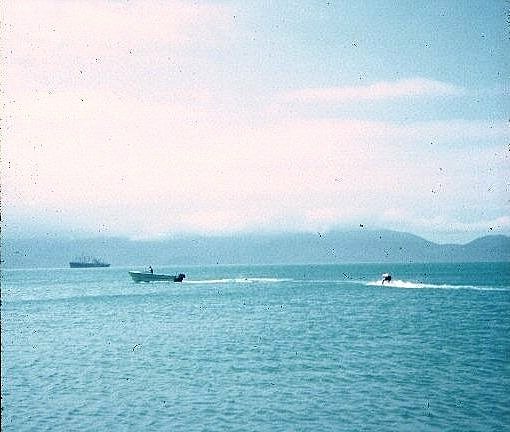 Therefore, we sat out in the ocean, off the coast of North Vietnam with only one engine. With two working engines we could out run anything. Everybody, and especially me, were really concerned about being a sitting duck for the enemy. 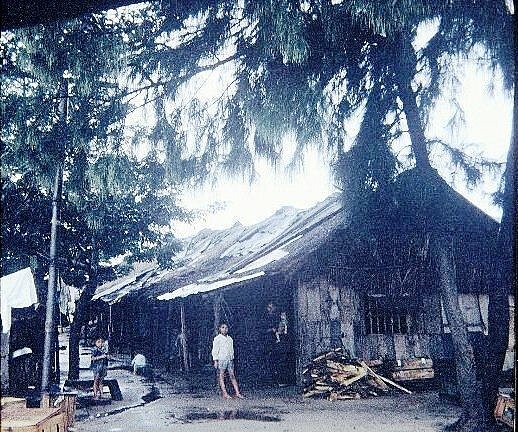 We were stuck waiting for the Seal Team to return from their mission ashore, and also saying our prayers that the North Vietnamese won’t see us. Finally, the Seal Team returned to our boat and we left in a hurry on one engine. That night had enough excitement for me. 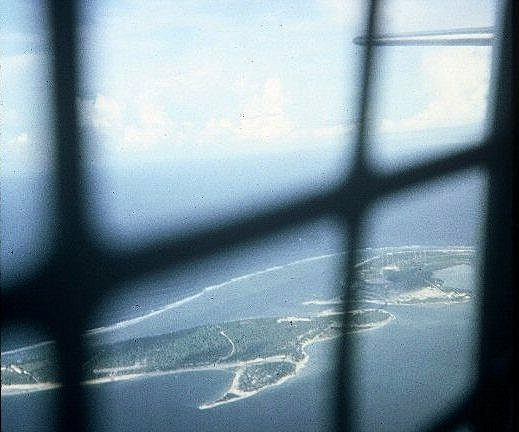 Since I worked in the engine shop, I also had to be the engineman on some of the boat trips to the island we kept the North Vietnamese prisoners; we called it Do-Do Island. I don’t recall what the correct name was. 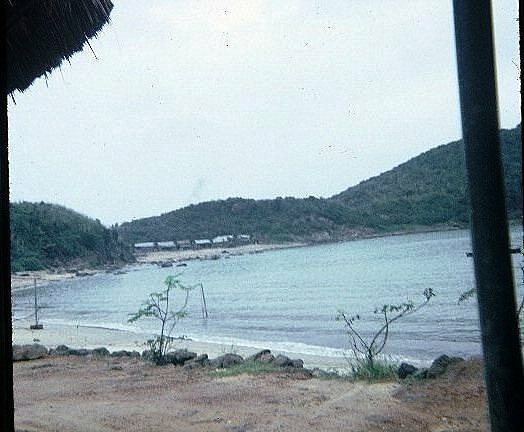 On one of our trips to the island we took a boat load of supplies and some Vietnamese guards. 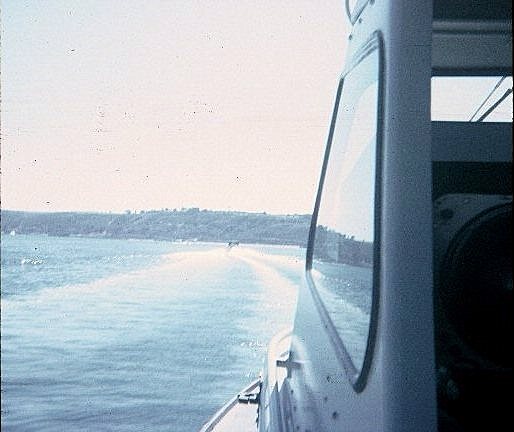 Even though I was an engineman, I took the helm of the boat on occasion and enjoyed steering the boat in calm water. 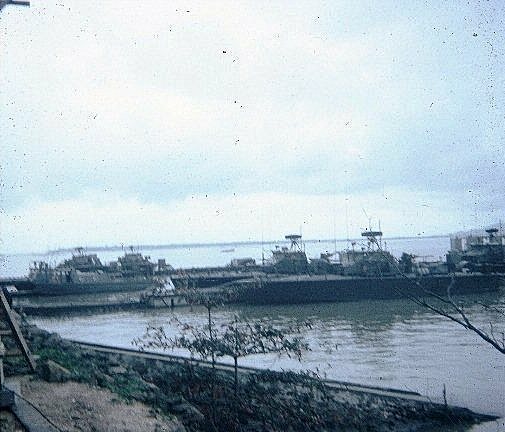 After we unloaded our supplies on the island, we boarded some Vietnamese guards from the island to bring back to Danang. On this particular trip, we got caught in a storm on the way back to Danang. Petty officer Martin, the boat driver, and I were in the front of the swift boat with the Vietnamese guards in the back, smoking their smelly cigarettes. As we left the island the storm got really bad with the ocean waves pounding our boat. The waves were huge, with swells above our boat, and we felt like a cork as we bounced around the ocean. I looked back in the boat and saw several of the guards hanging over the back of the boat, puking their insides out. Awhile later, Martin told me to take the helm of the boat because he had to join the guards at the back of boat in the puking party, for a few minutes. Martin told me, “keep on this compass course and keep the boat headed into the swells”. Boy, was that a challenge! That was the longest few minutes of my life… Keeping the boat straight on course was next to impossible. I kept thinking the boat engines are going to crap out on us and we will then get overturned by a wave. Thank god it didn’t happen. I never wanted to experience that type of boat ride again. That trip took us probably three or four times longer than normal to get home. Don't forget, this is going back 40 years in my memory! Mike boat we used to run supplies to Do-Do Island. 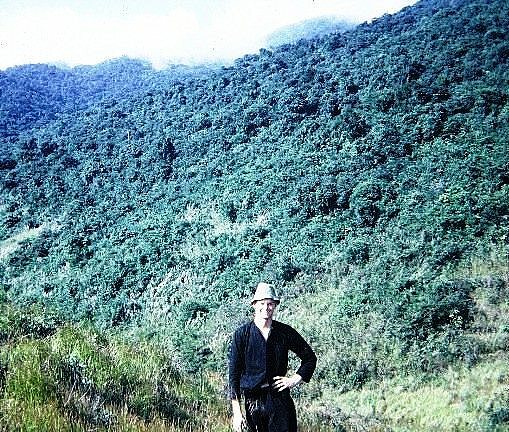 Where we kept North Vietnamese prisoners. 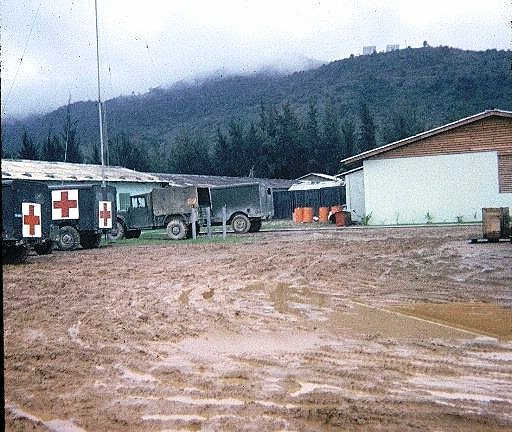 At camp Fay during monsoon season. 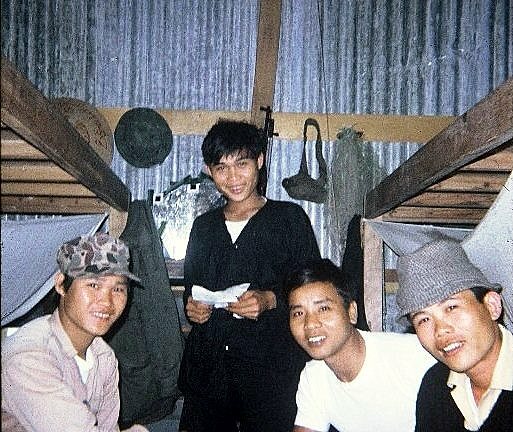 Vietnamese at our base. No idea their names or what they did. 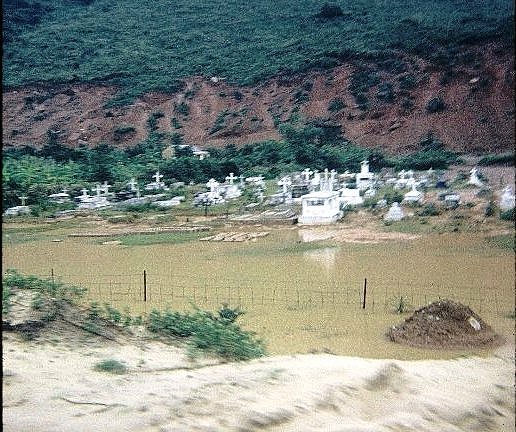 Cemetery along the road to spook base. 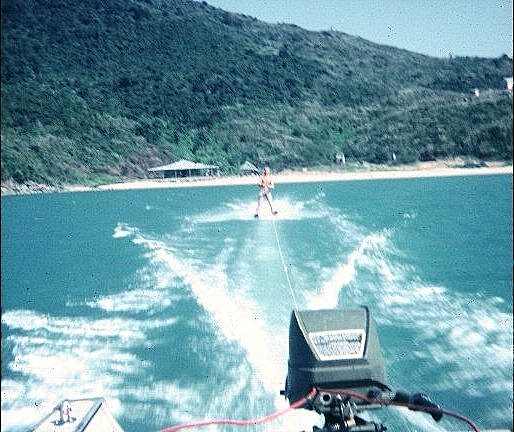 I think this was me learning how to water ski at our private beach. 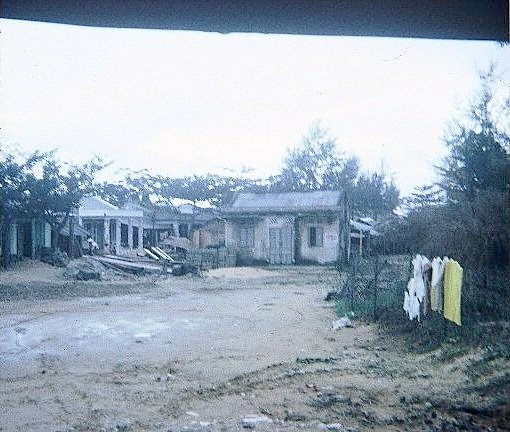 This was part of the town of Son Cha that was next to camp Fay. Taken at our private beach. I’m not quite sure where this was taken. Picture of somebody water skiing from our private beach. This was a view into Danang harbor I believe this is at our private beach, but I’m not sure. Picture of the inside of our room at camp Fay. “Smitty” (Smith) is to the left with no shirt, I believe Wickham is to the right talking to Smitty, Ludivisy (??) is smiling in the center of the picture, Rose is laying down on the bunk, Warrant officer Erlandson is smoking the cigarette. The other people I don’t know. As you can tell it is monsoon time so the clothes are drying indoors. Picture of the sign that hung over the entrance into our mess hall. This is me on Do-Do Island. 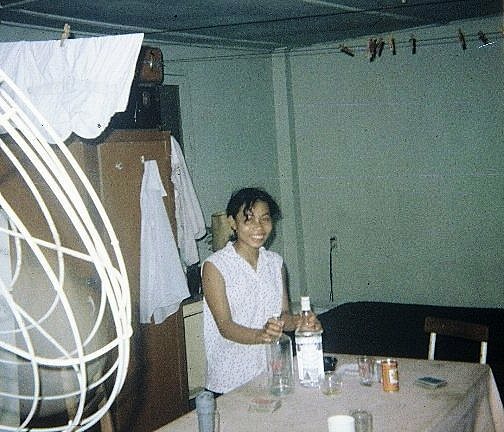 I was eighteen and skinny. 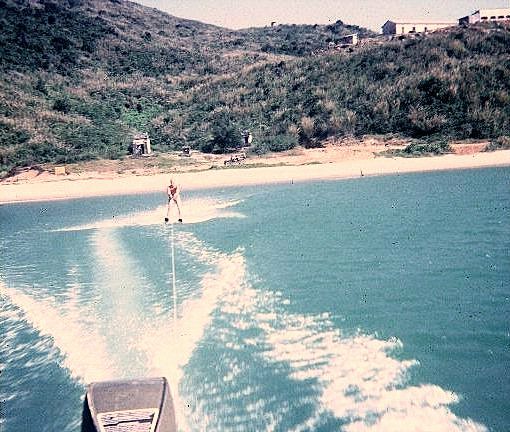 Water skiing picture going into danang harbor with our private beach behind. Not quite sure where this was taken. I think Edwards was in the black pajamas. This was taken at the spook base from our guard shack. 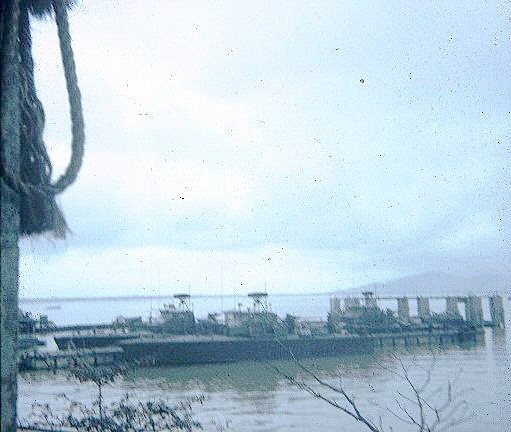 It shows the PTF’s docked and a couple swift boats, showed in the left ,we used for various missions. 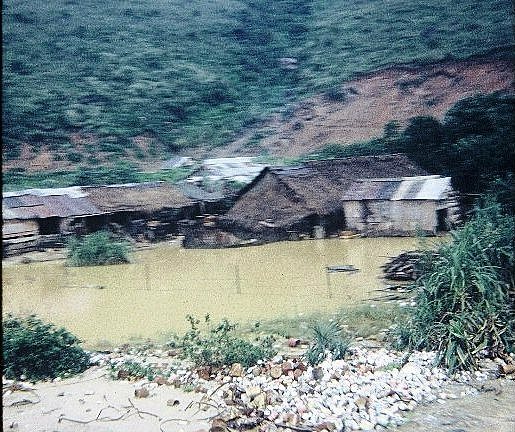 Another picture of the houses in Son Cha. 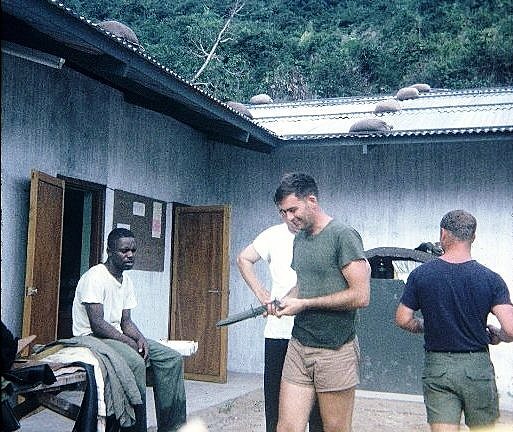 I think this is at camp Fay. Picture of the Nasty’s along the docks and the dry dock in the back. Our maid cleaning up our mess. We had 4 people to each room. I think each maid had two rooms to take care of. Orders for the group of us to go to MST 1 in Danang Vietnam. 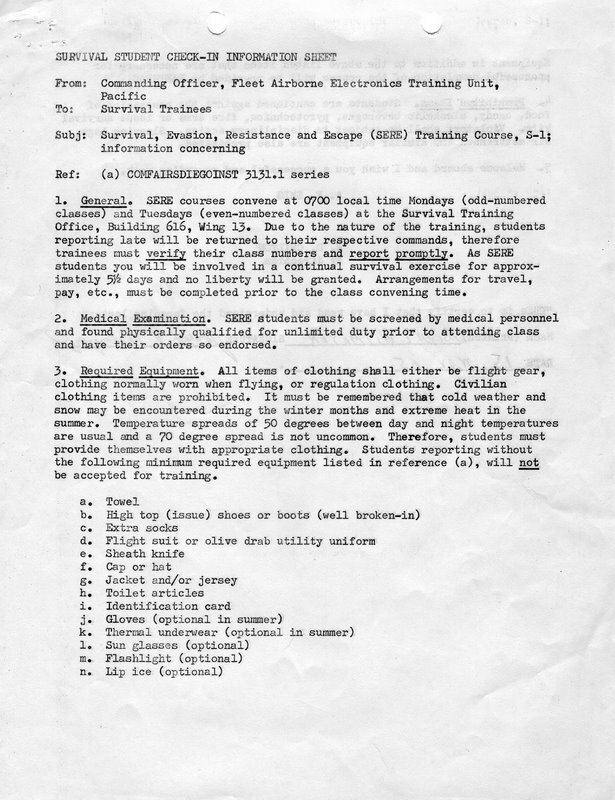 Notice Lt. Lueth is on this order. Change in orders. Ltjg Larson took Lueth place. Lueth went out and got really drunk and caused some problems. I think he was put in jail. Larson was really a nice officer. I’m really glad Lueth didn’t go with us. 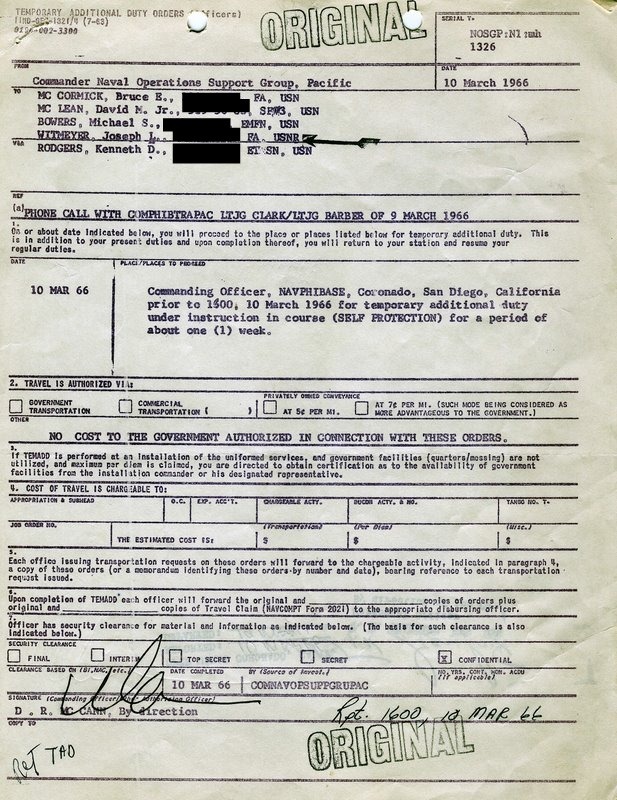 This was a rare case when we got orders to go to San Clemente Island in May 1967, for our normal simulated PT boat attacks on the Pacific Fleet. I believe this was the only time we got written orders while I was at the Amphi-base in San Diego. 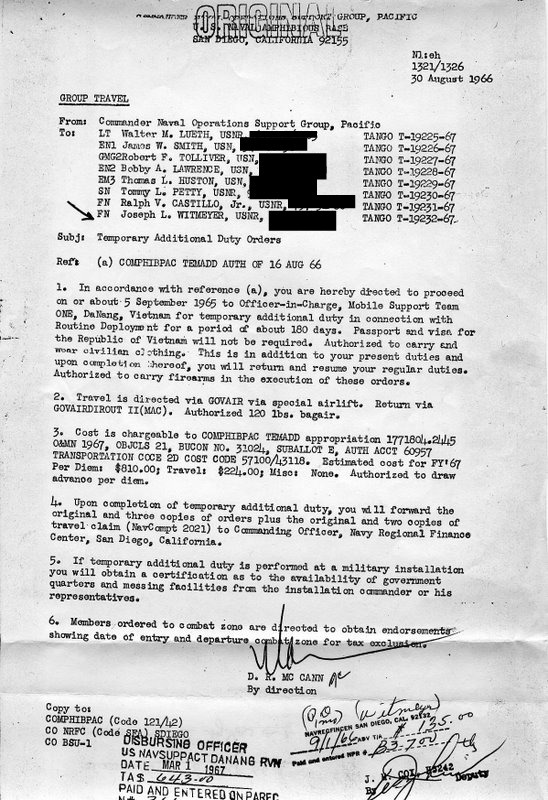 Orders to go to Camp Pendleton for weapons training. This was a interesting time for me. Learned how to fire numerous types of weapons and even threw a grenade. At night we went to the marine club on base. I could only drink coke since I was under age. One night several members of the Seal Team were present in the club and kept playing the juke box song “Green Beret”. After it played 5 or 6 times, some of the Marines got upset and start a little argument with the Seal Team guys. I didn’t stick around when it got heated. I was a eighteen year old chicken little. I heard the next day that the Marines got their butts kicked. 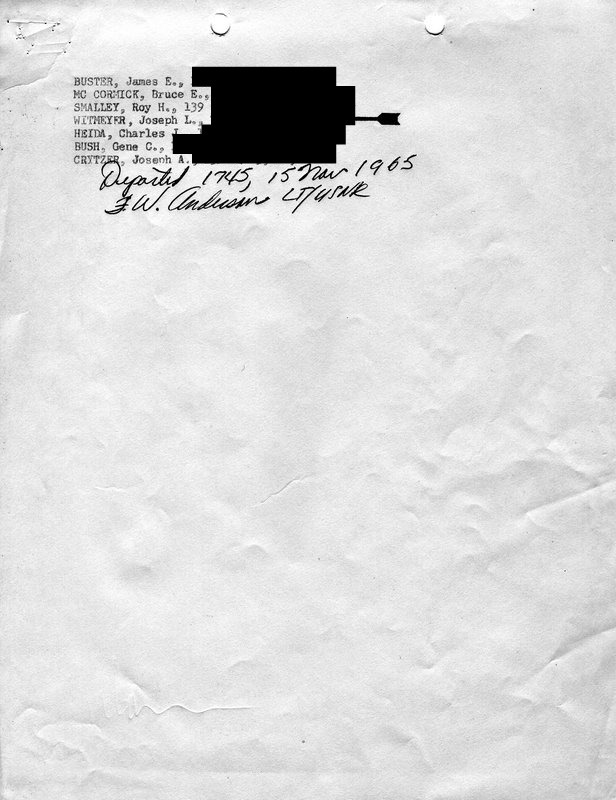 Listing of people for the orders for the PT boat attacks in May 1967. Sorry the picture is blurred. The original is blurred. This was part of our orders for Da Nang. It stated that no government messing was available. Therefore, we got per diem pay. That was a lot of $$$. 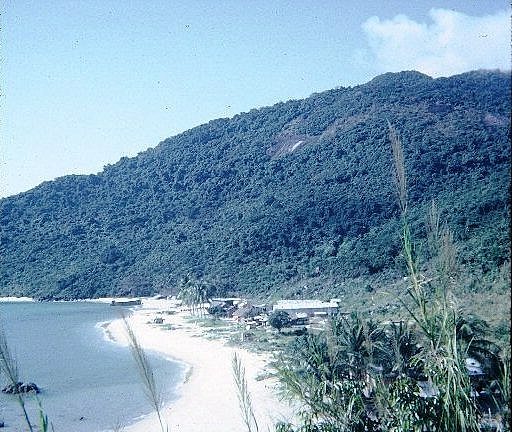 That is why people liked going to Da Nang for temporary duty.